1 Sean Moran has discovered that Tommy Jackson's shirt had the club badge stitched on upside down in this game. Move your cursor over the kit to reveal the variant. The trim on the sleeve had three narrow red bands. 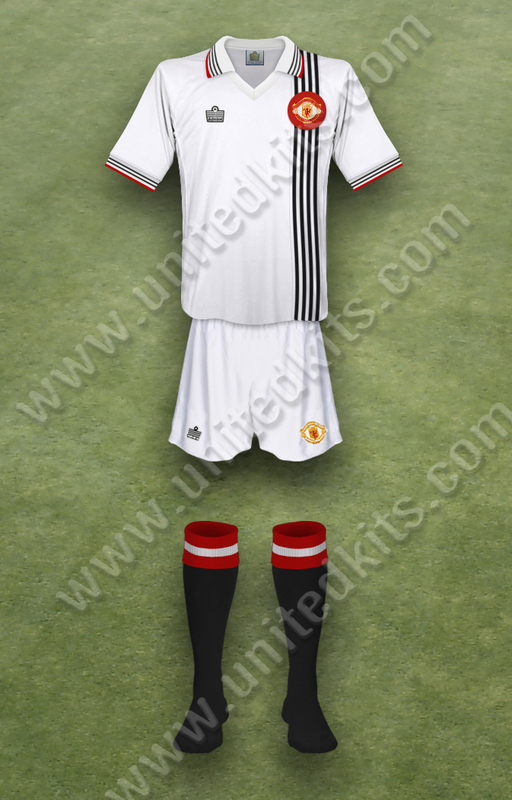 United loaned black shorts (from City's change kit) to avoid clashing with City's white shorts. The trim on the shirt sleeve had two narrow and one broad red band. The shirt also featured an Admiral logo. The trim on the shirt sleeve had two narrow and a broad red band. Worn with black shorts. The shirt featured the Admiral logo, and the trim on the shirt sleeve had two narrow and a broad red band. Worn with black shorts. Simple V neck collar. The trim on the shirt sleeve had two narrow and a broad red band. Simple V neck collar. The trim on the shirt sleeve had two narrow and a broad red band. Worn with black short. Alex Forsyth wore a shirt with three narrow red bands on the sleeve trim rather than the standard two. Paul English has discovered a photo of Gordon Hill in an aertex shirt with 1976 FA Cup Final embroidery, although we can't find evidence it was actually worn in the Cup Final. The shirt was made of aertex with three narrow red bands on the sleeve. The kit was identified by Sean Moran, who discovered several match photographs from United's World Tour. 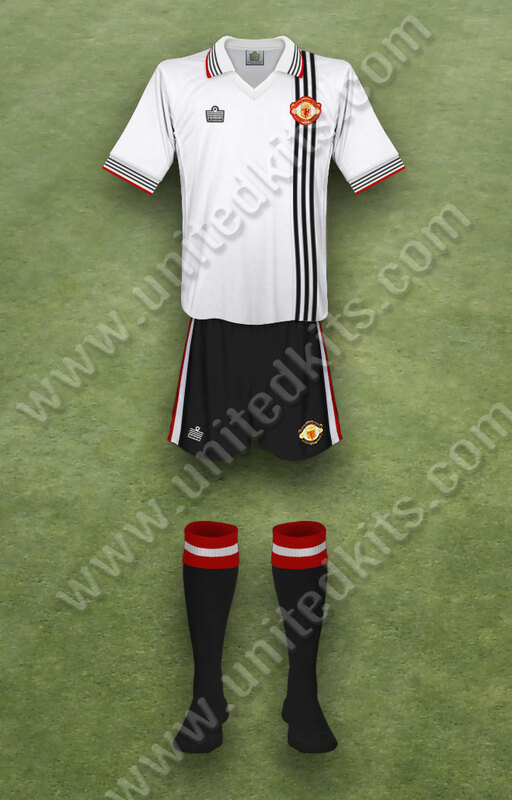 Joel Brobruck has confirmed that United wore ther Admiral aertex shirt on the Australian leg of that tour. 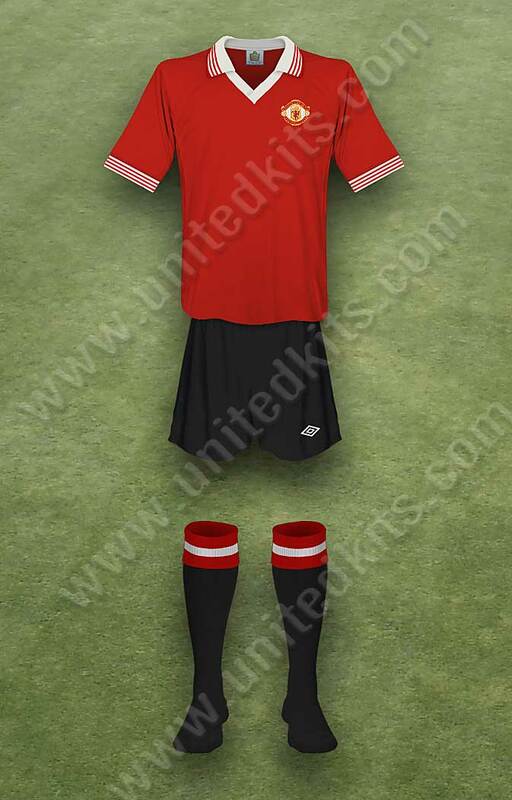 James Thomas has sent photographs from the pre-season tour of Denmark, which shows United in this kit in all three games. This kit was identified by Roy Jeffries and was probably worn against Celtic on May 17th 1976. 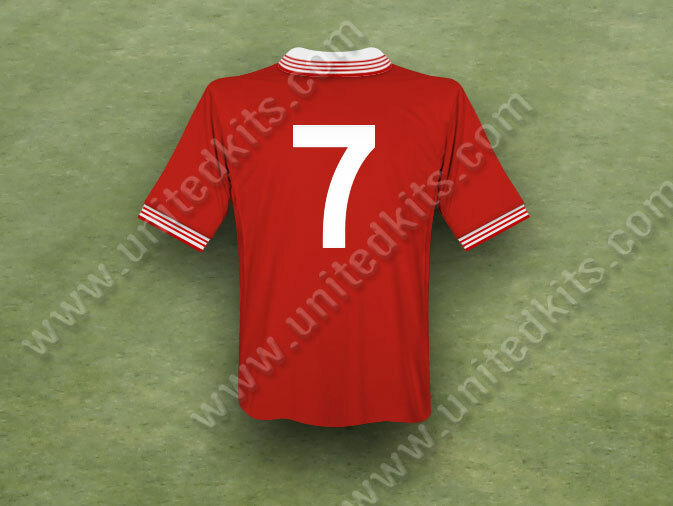 It is the simpler V-neck design introduced in April 1976 and the trim on the shirt sleeve has two narrow and a broad red band. The Admiral logo is yellow and blue (similiar to the retail replica shirt). 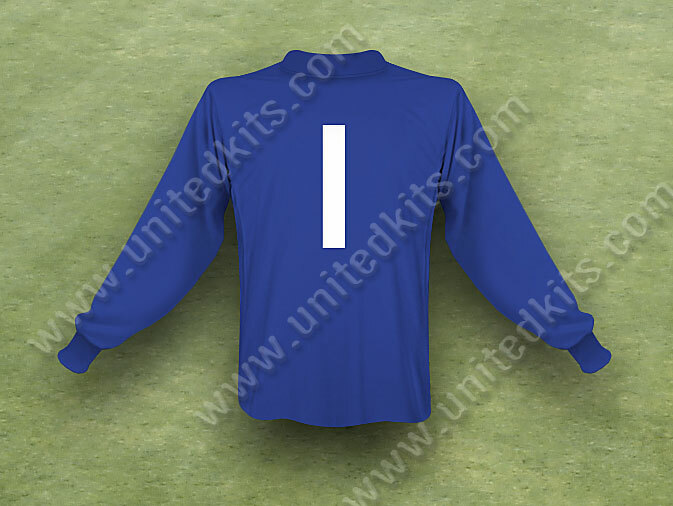 Although this style logo had appeared on goalkeeper shirts, this is the only evidence we have found of it appearing on an outfield shirt. 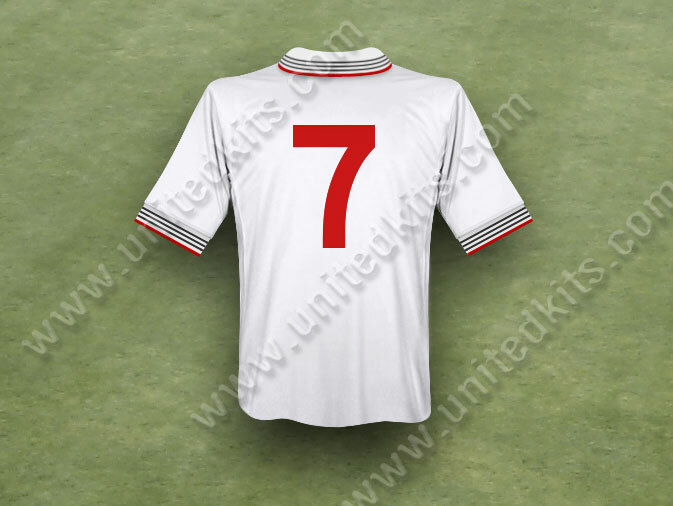 The shirt has the simpler V-neck design introduced in April 1976, and the trim on the shirt sleeve has two narrow and a broad red band. The shirt has the simpler V-neck design introduced in April 1976, and the trim on the shirt sleeve has three narrow and a broad red band. Unusually the shirt also features the Admiral logo as well as the club badge. United, who maintained their cavalier attacking style, were title contenders for most of the season, and also reached the F.A. Cup Final. Unfortunately they lost three of their last six League games and finished third and were beaten by Second Division Southampton in the Cup Final. Admiral's original home shirt had a cross over V neck collar with three narrow and a broad red band on the sleeve trim. This was replaced by a simpler style V neck in April 1976. There appears to have been no consistent supply policy and consequently United wore several different style kits through the season. 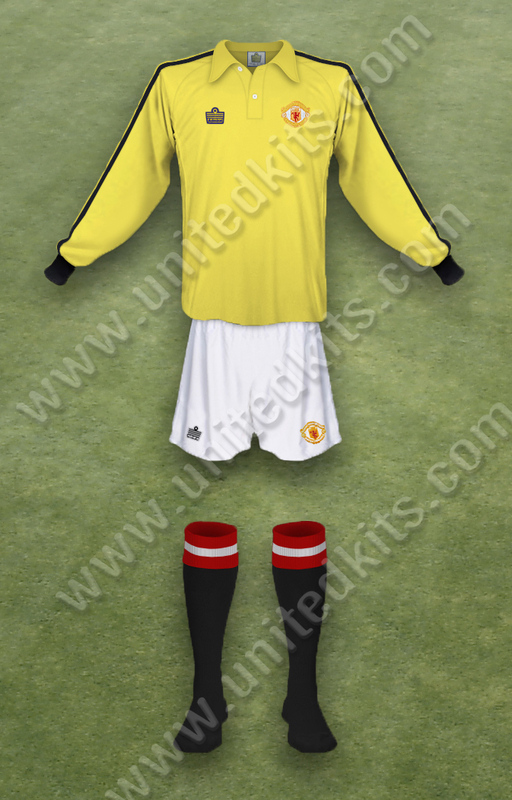 There were also a number of variants of the goalkeeper shirts, notably three different coloured Admiral logos wrere used on the home shirts (red, black and gold). 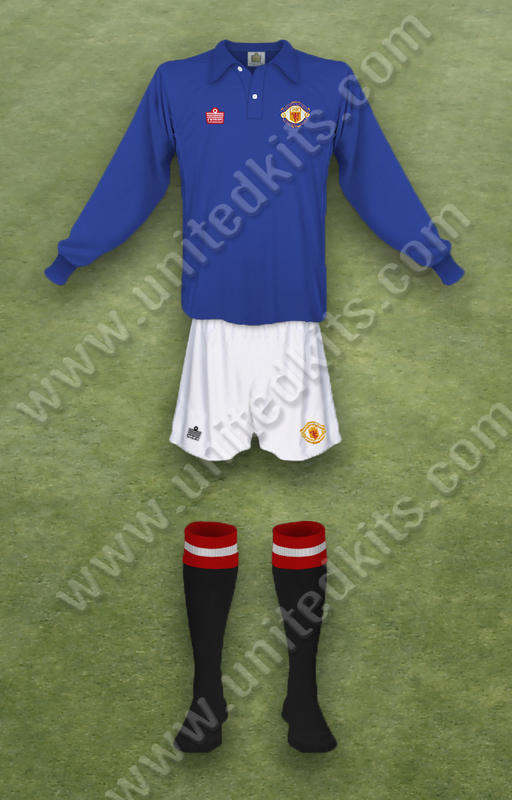 The Cup Final shirt had an embroidered trophy and Wembley 1976 under the club badge and to comply with FA rules the Admiral logo was missing. The shirt worn by Alex Forsyth had three red hoops on the sleeves rather than the standard two. Outfield shirts were available with both long and short sleeves, although we are only displaying the short-sleeved versions. The choice of sleeve length was left to individual players, which meant both styles were frequently worn in the same game. 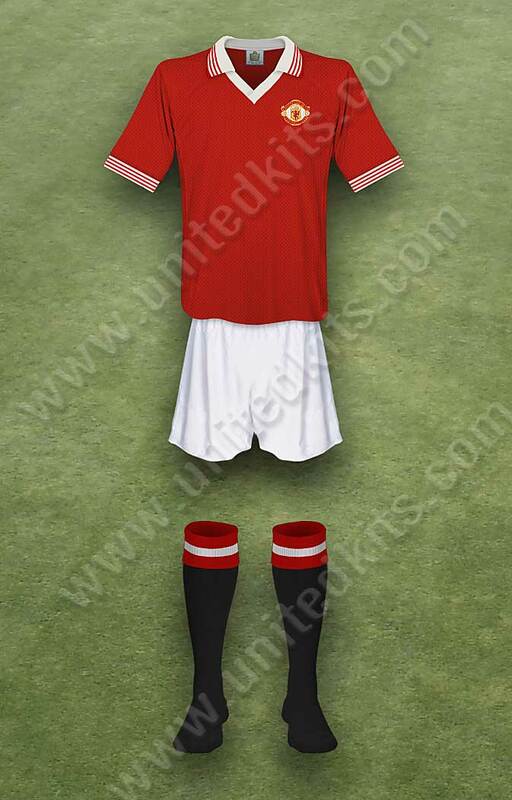 Replica shirts went on sale priced at £15 (or three times more than a generic red shirt). The club crest and Admiral logos were heat-applied transfers which were prone to peeling after a few washes, and Tommy Nielsen has confirmed they were blue & yellow rather than red and white. Photos sent by Athanasios Papathanasiou and John Bailey confirm the replica change shirt had three rather than four black stripes and the socks were white with red and black tops. 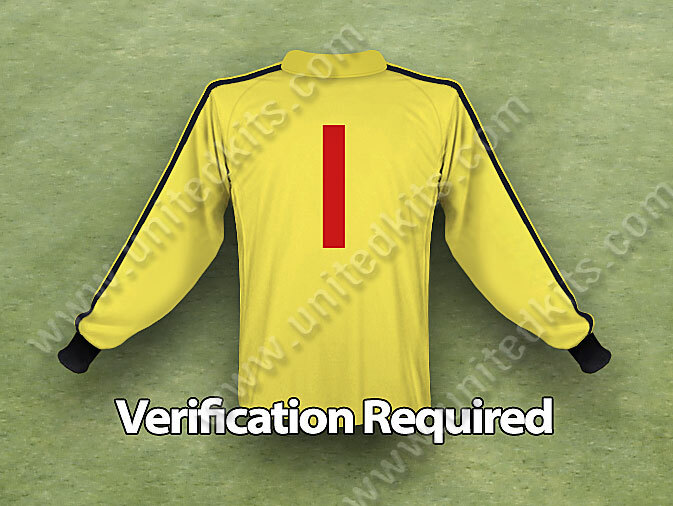 Tony Russell and Marvin Nash have provided invaluable information on the kits worn by United this season.